William O’Driscoll, the former head of IAM District 142 and an airline industry expert who guided thousands of IAM members through airline bankruptcies, tough negotiations and 9/11, passed away on July 8, 2016. O’Driscoll was born in County Cork, Ireland and educated at the Catholic Worker’s College in Dublin before immigrating to the United States, where he graduated from Cornell University. He began his Machinists Union career when he was elected Shop Steward in 1959 for Trans World Airlines (TWA) Local 1056 members in New York. He served on the Local 1056 Grievance Committee and as Trustee and President. O’Driscoll was the Chairman of the New York Strike Committee during the Great Airline Strike of 1966. 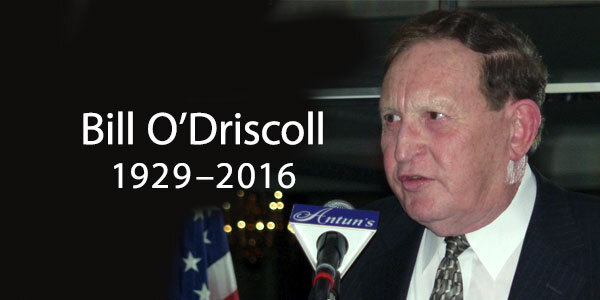 Perhaps not coincidentally, O’Driscoll, or “OD,” as he was better known, passed away on the 50th anniversary of that watershed moment in airline and labor history. O’Driscoll was appointed District 142 Acting General Chairman in 1969, General Chairman in 1974 and served as District 142 President and Directing General Chairman from 1985 until his August 2006 retirement. As District 142 head, O’Driscoll oversaw a diverse portfolio of 57 collective bargaining agreements covering more than 36,000 IAM members, while serving on the TWA Board of Directors. He led IAM members through three TWA bankruptcies in the 1990s. O’Driscoll freely shared his bankruptcy experience to help prepare other IAM leaders deal with the revolving door of bankruptcies that plagued the industry in the years following 9/11. O’Driscoll expanded the IAM’s airline membership by bringing Continental Airlines Flight Attendants into District 142. He negotiated innovative contract terms that changed the industry and have been adopted at other airlines, including making sure Flight Attendants had FMLA protection a decade before they were actually covered by the law. O’Driscoll aggressively fought the attempts by anti-union activists to divide his membership. His commitment to leveraging the strength of all IAM members, in all classifications, was absolute. “If the word ‘legend’ applies to anyone, it is Bill O’Driscoll,” said Pantoja.